What makes us so difficult to find peace and happiness in this world? Why do we have feeling of emptiness and jealousy? How do we find pure and calm mind in troubled life? 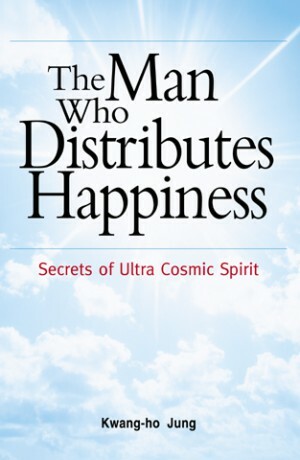 You could find the answer in this ground-breaking book The Man who Distributes Happiness published by EunHaeng NaMu Publisher. Kwang-ho Jung the author insists that he was given the Light which is equally said ultra cosmic spirit. He explains what the Light is, and what the Light can do for the people who receive it in this book. The Light, ultra cosmic spirit is the answer for the happy and rich life, and it depends on your mind to receive the light or not. The name, ultra cosmic spirit, is the word to express the power that is beyond super power, energy or solar light and avoid certain words which can cause misunderstanding as well as religious term. Substance of the power is from cosmic order and cosmic mind. The power that controls, adjusts and supervises the universe including the earth is the very cosmic mind and spirit. It is super natural and super scientific power, which comes from the origin of cosmos. So to speak, ultra cosmic spirit is absolute power of cosmos itself that maintains star, wind, light, life and everything. Therefore, the power is unlimited, warm and pure. It is superiority that tolerates all things but doesn’t display itself and wish cost. Only it exists as good, love, compassion and infinite. Basic principle of ultra cosmic spirit is the recovery of cosmic spirit purifying mind and stability, and achieves what people wishes. When cosmic mind which we have lost, is recovered, our body and life can go to the origin, which is the motive of ultra cosmic spirit. The original aim of ultra cosmic spirit is not for saving physical body. Saving life and curing disease is not the original commission of the power. Those things are just compassion of cosmic mind while preaching cosmic mind to the world. The ultimate aim of the power is to let people find their inner self. The power wants people to realize their Real self after taking off the body. It is the actual goal of the power so that people resemble cosmic mind. In order to guide people to recover original virtue, the power or the light came to me. “Another world that science can’t explain, mysterious world of ultra cosmic spirit” – Jung-bum Seo, Honorable professor of Kyunghee Univ. “We could learn how to make the life happy and rich and maintain us healthy” - Yun-jae Choi, Professor of Seoul National Univ. 왜 우리의 마음은 요동치고 있는가? 왜 여전히 우리는 행복하지 않은가? 왜 우리는 서로를 헐뜯으며 비난하고 있는가? 빛명상 창시자 정광호의 삶과 놀랍고 신비한 빛 이야기를 담은 빛명상 소개서 (은행나무 刊) 영문판이 출간되었다. 저자가 행복한 삶을 위한 답으로 제시하는 초광력(USC, ultra cosmic spirit)은 우주에서 오는 고도의 에너지로 사람의 염원이 아닌 우주로부터 오는 빛이자 힘이다. 우주의 마음으로부터 빛을 받고 그 목소리를 듣게 되었다는 저자는 이 책에서 나와 내 안의 진정한 마음의 문제 그리고 내 주위에 있는 세상에 대한 성찰을 강조한다. 중요한 것은 말과 이론이 아니라 실천이며 그 실천을 가능하게 하는 것이 다름 아닌 마음의 에너지, 즉 ‘빛’이며, 이러한 빛은 이미 우리 안에 내재되어 있다고 주장한다. 이 우주의 에너지는 인간이 처음 세상에 날 때 지니고 있었던 본연의 순수한 마음, 어린아이와도 같은 천진한 마음을 통해 전달되기 때문에 고요한 상태에서 스스로를 관조하고 반성하며 감사하는 생각을 가지면 이 ‘빛’과 교류할 수 있다고 한다. 이 책에 따르면 과학을 비롯한 여러 분야에서 이미 이 에너지 ‘빛’의 실체와 효과에 대해서 입증된 바 있으며 이를 현실에서 이용하고자 하는 노력도 이루어지고 있다. 빛명상은 이러한 초광력을 받는 과정, 우주의 근원에서 오는 고도의 에너지 ‘빛’과 교류하는 것을 뜻한다. 이 빛명상 프로그램은 저자가 20여 년 간 연구한 결과를 체계화시킨 것으로 이미 수많은 체험자들의 증언을 통해 그 효과가 입증된 바 있다. 저자는 빛명상을 통해 험하고 불안정한 세상 속에서 순수와 행복을 찾을 수 있다고 강조한다. 인간을 초월한 힘의 존재인 초광력은 사람들의 불치병을 고치기도 하고, 부를 주기도 하지만 이는 에너지가 주는 마음의 풍요와 행복, 평화에 따른 부수적인 열매일 뿐이며, 초광력의 진정한 목적은 심신의 정화와 진정한 삶의 행복을 추구하는 것이다. 저자가 말하는 빛명상의 본래 사명은 육체의 구원보다는 인간으로 하여금 “내 안의 순수한 자아”를 찾아 우주의 마음을 닮게 하여 본래의 ‘참’을 회복하고, 이로써 행복한 삶, 사랑이 충만한 삶을 살게 하기 위한 것이다. 이 책은 이러한 저자의 관점에서 저자 자신의 빛명상 경험을 비롯해 빛 명상으로 건강을 얻거나 어려움을 이긴 여러 사람들의 다양한 체험을 담고 있다. 빛명상의 창시자. 본연의 순수한 마음으로 돌아가 우주의 에너지와 교류함으로써 온 인류와 지구의 정화를 주장하는 정신문화운동가. 대구에서 태어나 20여 년간 호텔 매니저 일을 해 온 평범한 직장인이었다. 그러나 1986년 우주의 큰 빛을 만난 후, 보다 많은 사람들에게 "빛"을 나누어 주기 위해 촉망받던 사회인으로서의 지위를 버리고 1994년 우주초광력학회를 설립하였다. 이후 현대의학으로도 고치지 못하는 수많은 사람들의 건강을 되찾아 주고, 불안한 현실을 살아가고 있는 현대인들에게 행복을 나눠주고 있다. 저서로는 , (한글판), 등이 있다.